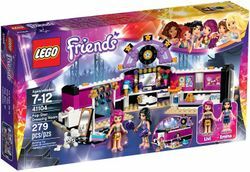 41104 Pop Star Dressing Room is a Friends set released in 2015. The set includes a dressing room with five sections. 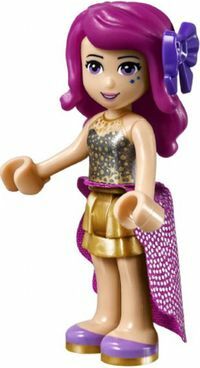 Two mini-doll figures, Emma and Livi Star, and a dog named Cookie are also included. The centre section of the set is the vanity. The vanity is built upon a 8x16 brick yellow baseplate. The wall is built up with black bricks, including hinge pieces which connect the sections. Over the black bricks are white plates and bright reddish violet bricks. The side users bright reddish violet panel pieces over bricks. The roof features a warm gold pole coming out of a 2x4 white plate with a hole in the middle. The sign uses a bright red technic pin which goes through a light stone grey 2x2. The sign uses medium lavender "A" shaped plates to give a semicircular look. At the end of the tips of the circle is a flame yellowish orange star. The sign has a large circle in the centre. In the centre of the circle is a warm gold 2x2 circular flat tile with a medium azure star sticker. The inside features a chair on a white turntable. The chair is built upon a black circular plate. It has a medium lavender cushion, white curved back and sloped arms. There is a warm gold star clipped on to the back of the chair. In front of the chair is the vanity table. The table has a drawer to the left which holds a pair of sunglasses and a star. The table top is a white 2x14 plate. It features two black 1x2 jumper pieces at the right end, while there is a bouquet and a lipstick in the other. On the right side there is a warm gold perfume bottle and two accessory holders. The mirror is a sticker applied to a 1x6 black tile piece. It features a picture of Cookie, Livi's name and a cartoon picture of Livi, embedded into it. The mirror has transparent yellow lights around it. A blue wig on a white minifigure head is to the left. The section to the left is the dressing area. The structure is similar to the vanity, built on a 8x16 baseplate with black, white and bright reddish violet walls. In addition to being much longer, the differences in the structure include the roofing being white, in the middle of the bight reddish violet panels there is a transparent brown window and there is a post box embedded in the side wall. There is a clothes wrack in the centre that has white sides and a warm gold rail. Three hooks are hanging on the rail, two of which hold overcoats. To the left of the clothes wrack is a mirror which is connected by clips. Across from the clothes wrack is several 1x2 plates stacked up, with a sticker on a 1x2 tile representing a box of shoes. Behind the side wall of the dressing area is the place where Cookie sleeps. It is built upon 6x8 brick yellow baseplate. Cookie's bed is similar to Livi's chair, curved white edges and medium lavender cushions inside. A medium azure square-shaped bowl where Cookie eats is beside his bed. Across from his bowl is the other side of the post box. The post box has a sticker of post on a 1x2 slope tile. The section to the right of the vanity is the lounge area. The bulk of the walls is the same as the dressing area but mirrored. The only difference is that there is a door instead of a post box. The lounge area has stickers upon the panels. The sticker on the left represents Livi's record and a picture of her and a friend. The sticker on the right represents trophies she and Cookie have won. There is also a mini fridge which has a bottle of water inside. The fridge has a flame yellowish orange bowl on top, that holds a bright red apple. To the right of the fridge, is a sofa bed. The sofa bed has a black squared base, medium lavender cushions, white back and side. Beside the sofa bed is a newspaper holder, that holds the school newspaper "What's At Heart?". Behind the side wall of the lounge area is the waiting area. Like the place where Cookie sleeps it is also built on a 6x8 brick yellow baseplate. The door has a black frame, white pane and warm gold knob. A couch is set outside. It has a medium lavender and white square shaped base, flame yellowish cushions and bright reddish violet arms. The hinge pieces allow the set to be arranged in several different ways. Two mini-doll figures are included; Emma has long straight black hair. She has fair skin, bright green eyes and bright purple lipstick. She wears a medium lavender jacket over her sleeveless silver shirt. Emma's skirt is earth blue and her shoes and anklets are medium lavender. Livi Star has long bright reddish violet hair. She has fair skin, violet eyes and bright purple lipstick. Livi wears a gold best design over her silver torso. She wears a warm gold skirt and medium lavender shoes. Cookie is also included. He has violet eyes and black spots one of which is shaped like a music note. Emma is styling Livi Star before her show. Emma styles Livi's hair, picks out an accessory and an outfit. After Emma has the pop star styled the two relax in the room. They play with Cookie and pamper him as well as rest in the lounge area. Give Livi a superstar makeover for her big performance! Facts about "41104 Pop Star Dressing Room"